Enjoy the smooth ride in one-of seven sporty models available for the 2018 Jeep Compass. With both street and off-road capabilities, the Compass offers a comfortable and quiet ride. 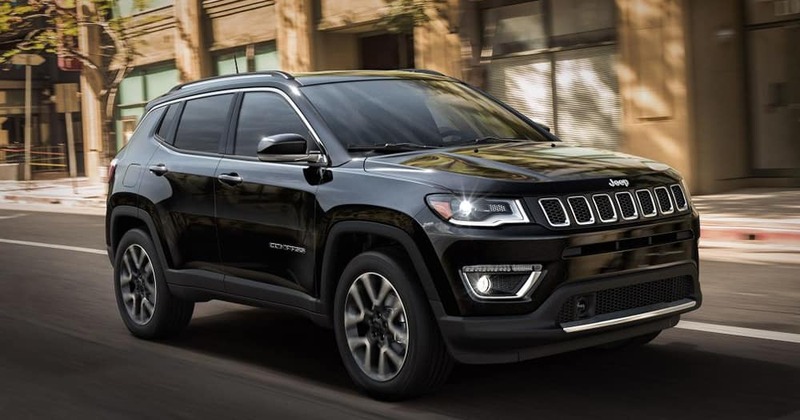 The Jeep Compass is available in seven stylish trims that show off the sleek lines, signature 7-point grille work, innovative lighting, exotic body and wheel colors, and unique detailing. The exterior makes a statement with available features such as a black grille with chrome accents, body-colored front and rear bumper, black bodyside cladding, side windows trim, and door handles, and heated manual folding side mirrors. Ample lighting, such as cornering lights, front fog lamps, Halogen daytime running lights with delay-off option, and perimeter/approach lights, provide a clear driving environment. These lighting options are available in either the Sport, Latitude, and Limited with front-wheel drive (FWD) trim or the Sport, Latitude, Trailhawk, and Limited four-wheel drive (4WD) trim. 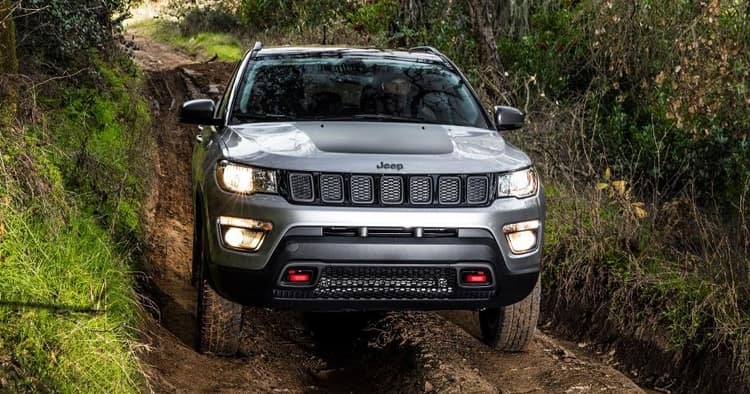 The Jeep Compass packs plenty of power in its 2.4-liter Inline-4 MultiAir engine with a 6-speed C635 manual transmission, 180 horsepower, and 175 pound-feet torque at 3,900 revolutions per minute (rpm). A 9-speed automatic transmission is also available for select models. The Compass features front and rear strut suspension with coil springs, 160-amp alternator, gas-pressurized shock absorbers, maintenance-free battery with run-down protection, electric power-assist steering, and autostick sequential shift control. 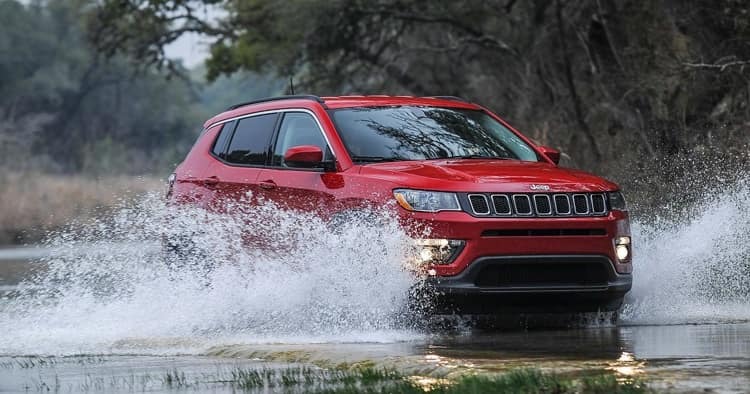 The Jeep Compass is a capable SUV ready to take on off-road trails and inclement weather conditions when equipped with the Jeep Active Drive system. The SUV is prepared to perform in tough conditions due to its well-known traction capabilities and maneuverability. Its competitive fuel economy ratings are 23/32 mpg for the FWD with manual transmission, 22/31 mpg for the 4WD manual and FWD automatic, and 22/30 mpg for the 4WD automatic. For drivers, the Jeep Compass encompasses the spectrum of useful features to enhance the driving experience. Available features include manual tilt/telescoping steering column, cruise control, driver footrest, front map lights, 6-way adjustable driver and passenger seats, height adjustment, compass, and remote keyless entry. 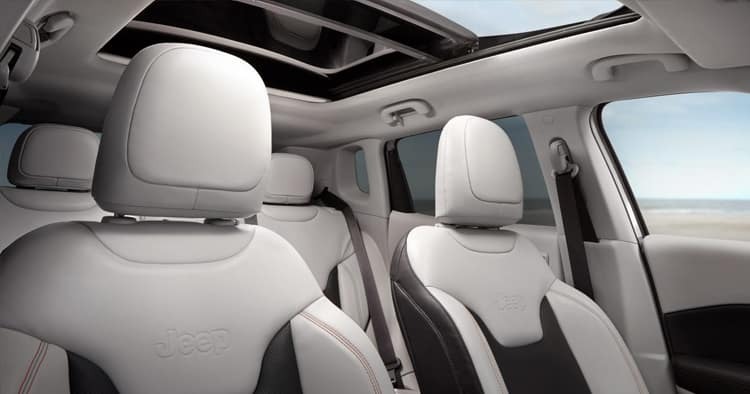 Passenger comforts include low-back cloth bucket seats, sliding front center and rear center armrest, two seatback storage pockets, illuminated visor vanity mirrors, glove box, rear 60/40 folding seat, cargo compartment lamp, and HVAC underseat ducts. State-of-the-art high-tech options are also available, such as the Uconnect 3 with 5-inch display or the Uconnect 4 with an 8.4-inch display. An integrated roof antenna supports the radio with seek-scan, six speakers, and wireless streaming. The Compass also has Bluetooth phone connectivity and two LCD monitors. The Jeep Compass is equipped with safety features focusing on stability, control, and construction. The SUV has Roll Stability Control (RSC), ABS and Driveline Traction Control, Electronic Stability Control (ESC), ParkView backup camera, low tire-pressure Warning, and side-impact beams. Interior safety features include manual anti-whiplash adjustable front and rear head restraints, rear child safety locks, lap and shoulder safety belts, curtain airbags, driver knee airbag, seat-mounted side airbags, front dual-stage airbags, and an airbag occupancy sensor. Additional available safety features include Hill Start Assist, LATCH-ready child seat anchoring system, anti-lock 4-wheel disc brakes, and panic alarm. 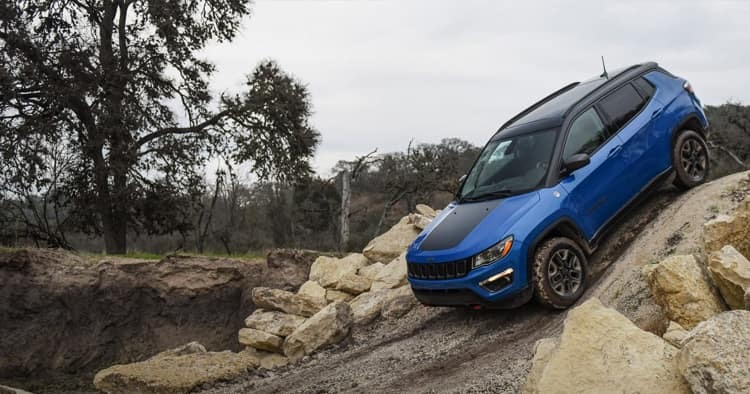 The Jeep Compass is a sophisticated ride with high-tech features, upscale design, and versatile capabilities that make each driving adventure a memorable experience. 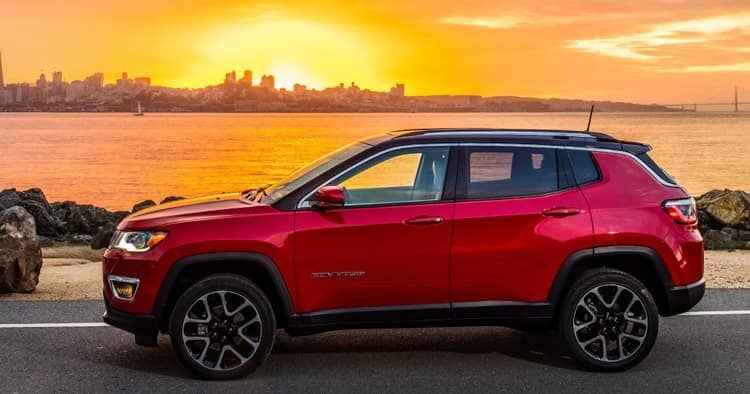 Get behind the wheel of the 2018 Jeep Compass and schedule a test drive today!